The search for gold has brought prospectors to every corner of the earth in search of the yellow metal. For centuries man has sought out rich areas that mining would be profitable. Areas that were worked out and gold quantities depleted were abandoned in search of new gold rich areas. In more recent history, advances in gold mining techniques have attracted new interest to lower grade ores, once considered of little value do to their limited quantities of gold. Today, many of these lower grade ores can be mined profitably. With this in mind, it may be of some interest to know that there is actually an estimated 20 MILLION TONS of gold in the world’s oceans! That would be enough for every person on earth to have nearly nine pounds each! This was first discovered by S. Sonstadt, an English Chemist in 1872. Since that time, countless chemists and scientists have explored ways to extract the gold out of seawater. So why don’t we all headed down to the ocean with our gold pans in search of some of this ocean gold? While it is indeed fact that gold in contained in seawater, the difficulty of extracting the gold lies in its extremely dilute existence. Although 20 million tons of gold may seem like an amazing amount, when you spread that throughout the entire ocean, you get a quantity of roughly 0.004 parts per BILLION. Another way to think about it would be that you would have to process around 30 million pounds of sea water to extract one ounce of gold. We are talking such miniscule quantities that it is hard to even wrap your head around it. Many have considered that perhaps some type of mechanism could be attached to traveling ships, which could work as some sort of collection device. To date, no one has been able to design such a device. 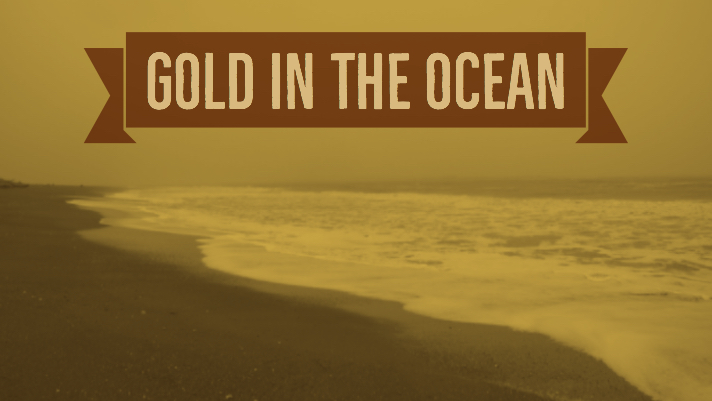 From time to time, you will hear someone make claims about successfully recovering gold from seawater, but they are generally looking for investors to take it to the next level (i.e. suckers to give them money). These fraudsters appear from time to time, and then recede into the shadows, with the seawater gold remaining safely in its place. With technological advances in the world, who’s to say what will happen. Maybe at some point in the future, someone will come up with a method to mine the ocean's gold. But for now, such a project is economically unfeasible, so we will continue to search for gold on land.